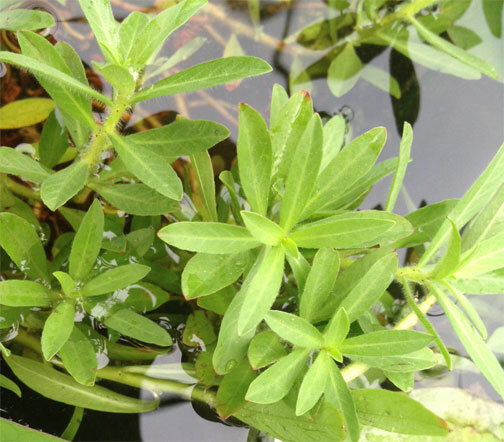 Please select the tab at the top of our product list to review the aquatic plant category of interest. You can also select the thumbnail photograph to review a larger image. Plants are available in 4.5", 1 gallon, and 2-3 gallon pots. Floaters and submersibles come as bundles. Pot sizes and prices are shown at the top of each category. 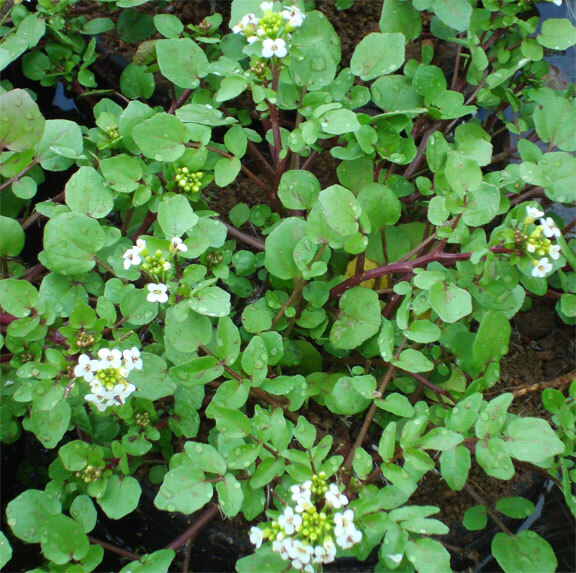 Alisma Large green leaves stand erect above the water with baby's breath flower. Sun to Part Shade White Up to 24" 1-6"
Arrowhead Also known as duck potato. Wide arrow shape leaves. 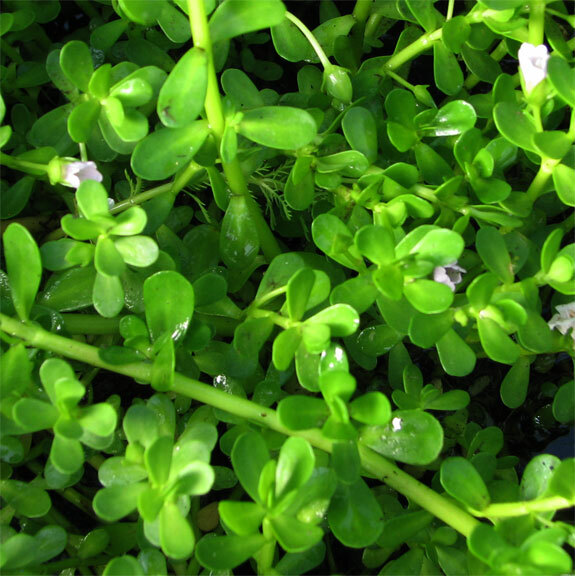 Sun to Part Shade White Up to 30" 1-4"
Bacopa [hyssop] Ground cover for the pond. 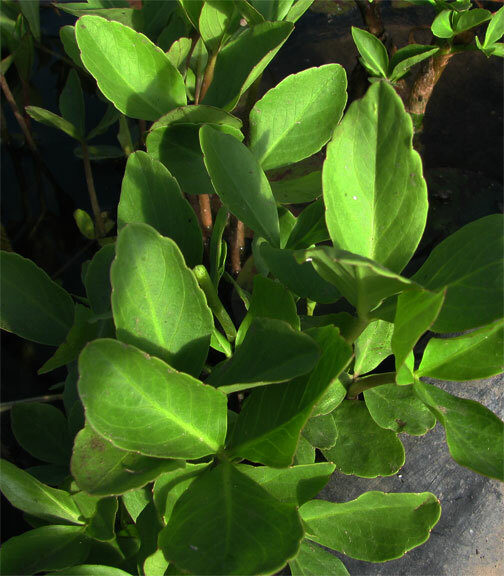 Sun to Part Shade White Up to 4" 0-3"
Bog Bean Round creeping shoots protrude into the water. Flowers early in the spring. 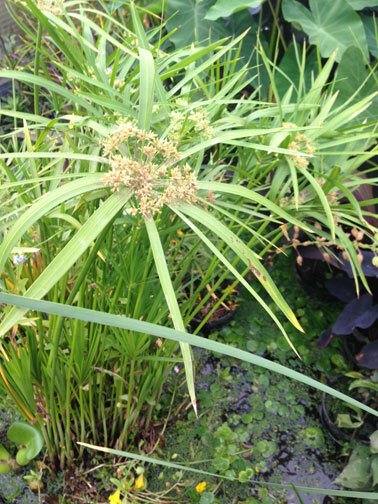 Sun to Part Shade White Up to 12" 0-5"
Bulrush Upright accent plant with dark green stems. Sun to Part Shade None Up to 72" 0-10"
Buttered Popcorn Green and yellow variegated leaves. Good for streams. 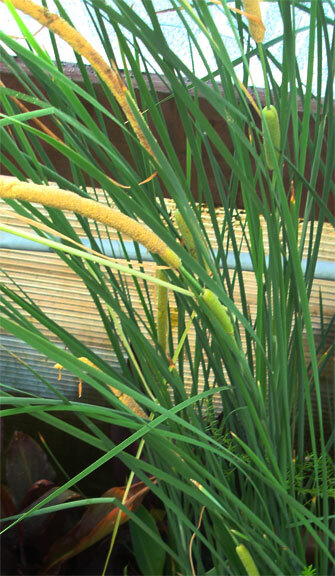 Sun to Part Shade yellow Up to 12" 0-3"
(dwarf) Small version of the cattail. Sun to Part Shade Brown Catkins Up to 36" 0-8"
(var/grace/dwarf) Green and white stripe cattail. 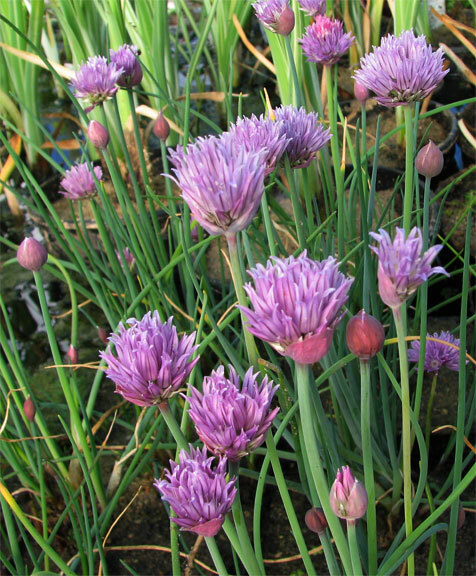 Sun to Part Shade Brown Catkins Up to 60" 0-10"
Chives Garden type chives adapted to water. 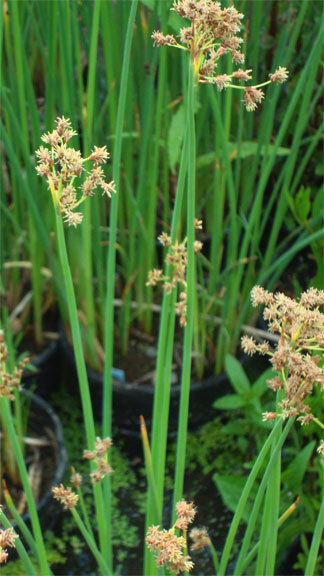 Sun to Part Shade Purple Up to 18" 0-1"
Corkscrew Rush Tightly coiled green foliage. 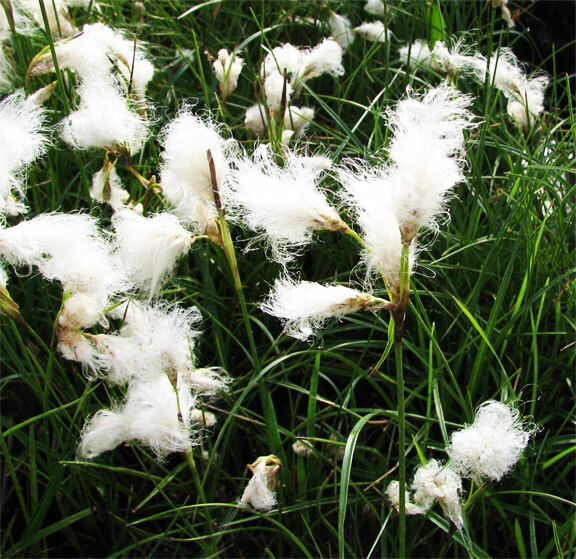 Sun to part shade None Up to 24" 0-4"
Cotton Grass Grass type plant with a cotton ball looking flower. Sun to Part Shade White Up to 10" 0-2"
Creeping Jenny Low creeping plant. 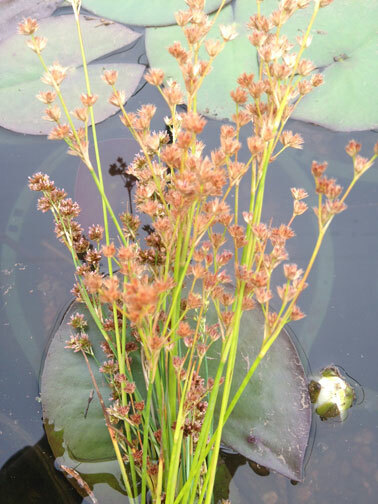 Good transition plant for edge of pond. Can be invasive in soil. 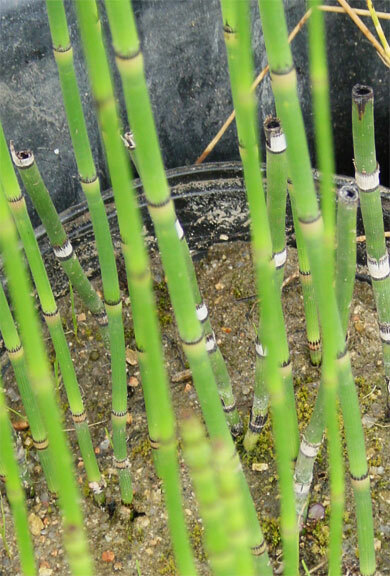 Sun to Part Shade yellow Up to4" 0-2"
Dwarf Bamboo Looks like small bamboo plant. Sun to Part Shade None Up to 12" 0-3"
Fireworks Rush Triangular shape stems with a taller center starburst type flower. 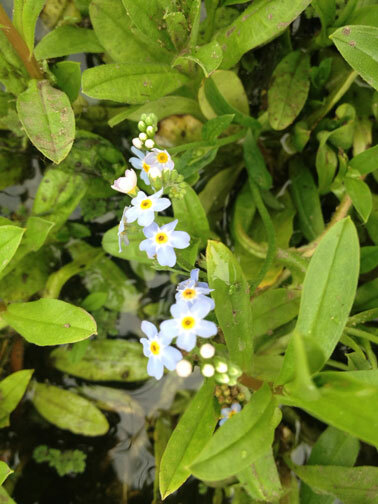 Sun to Part Shade Purple Up to 30" 0-4"
Forget-Me-Not(water) Dense green leaves. 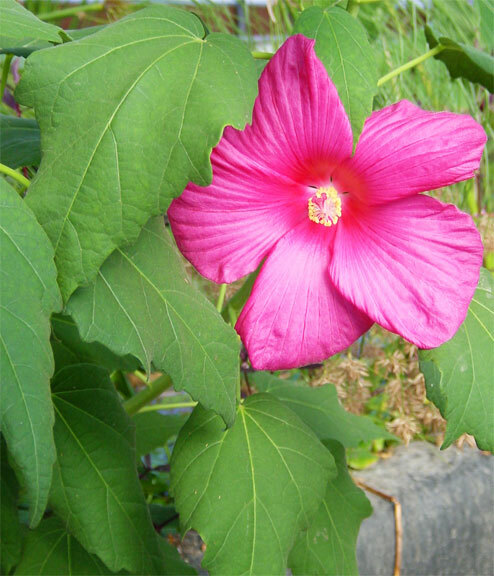 Sun to Part Shade Blue Up to 12" 0-2"
Hibiscus Also known as rose mallow. Large showy flower. Slow to come back in the spring. Needs to be lowered for winter. 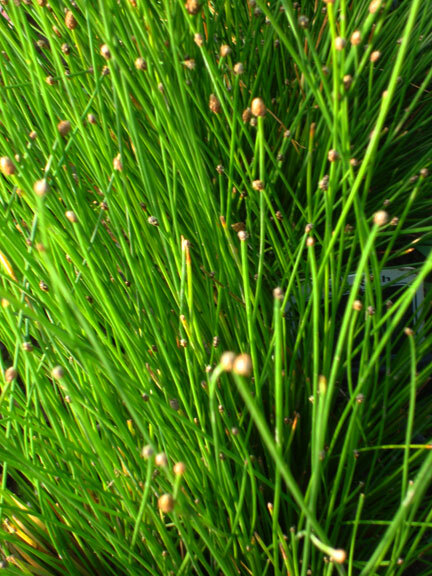 Sun to Part Shade Pink or White Up to 36" 0-2"
Horsetail Hollow stems with black rings around each joint. 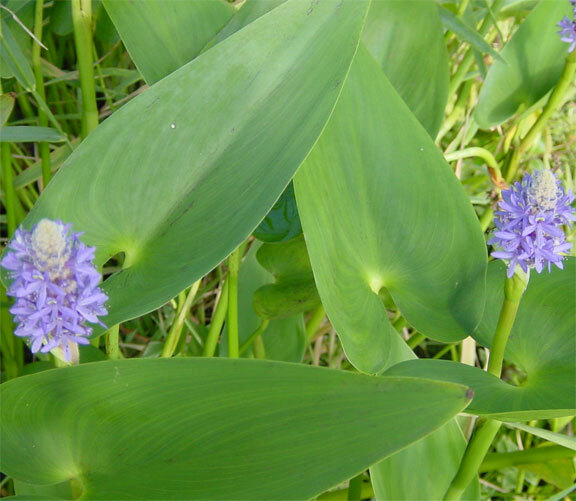 Can be invasive in shallow water. 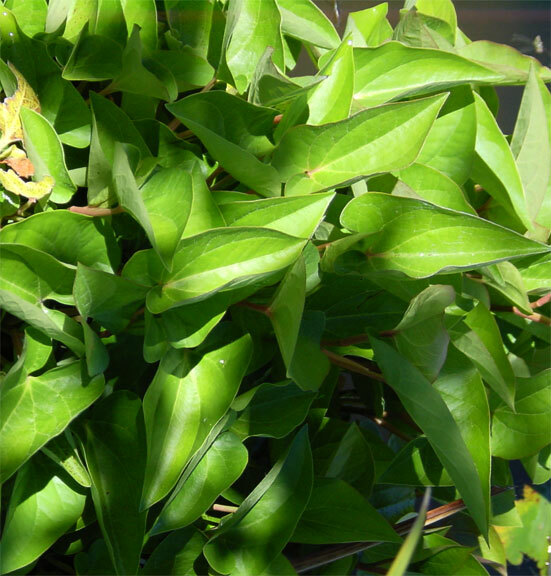 Sun to Part Shade None Up to 36" 0-4"
Houttuynia -chameleon Known for its brilliant multi-colored leaves. Good transition plant at edge of pond. 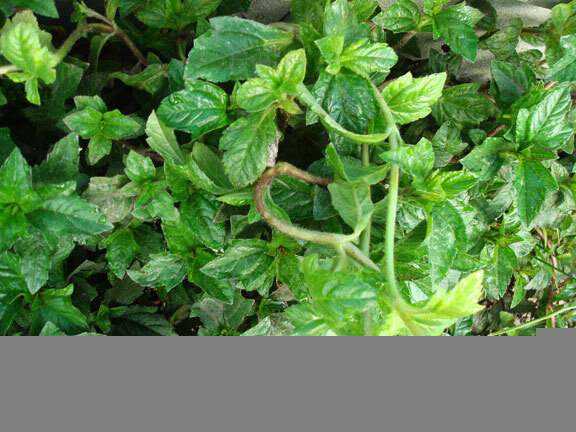 Sun to Part Shade White Up to 12" 0-1"
(dbl flower) Heart shaped blueish-green leaves. 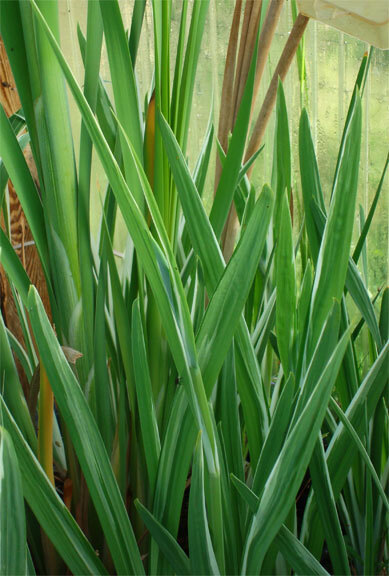 Sun to Part Shade White Up to 12" 0-1"
(blue/purple) Hardy iris plant suited for water. 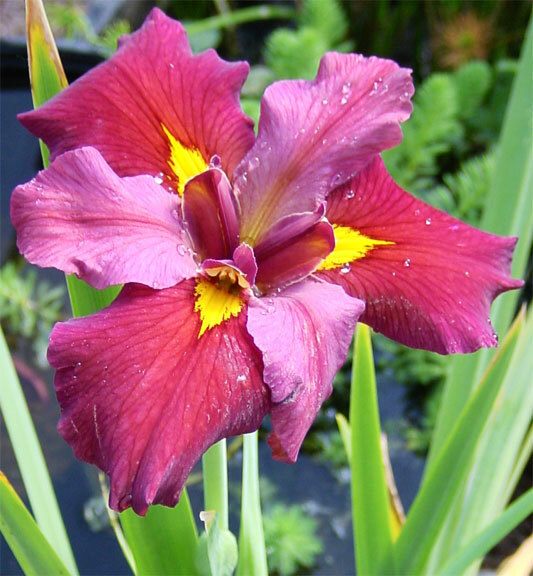 Sun to Part Shade Purple Up to 24" 0-3"
(pink) Hardy iris plant suited for water. 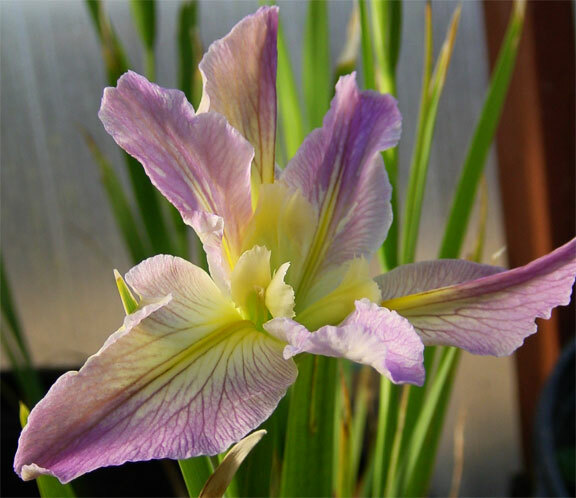 Sun to Part Shade Pink Up to 24" 0-3"
(yellow) Hardy iris plant suited for water. Can be invasive. Good for large ponds. 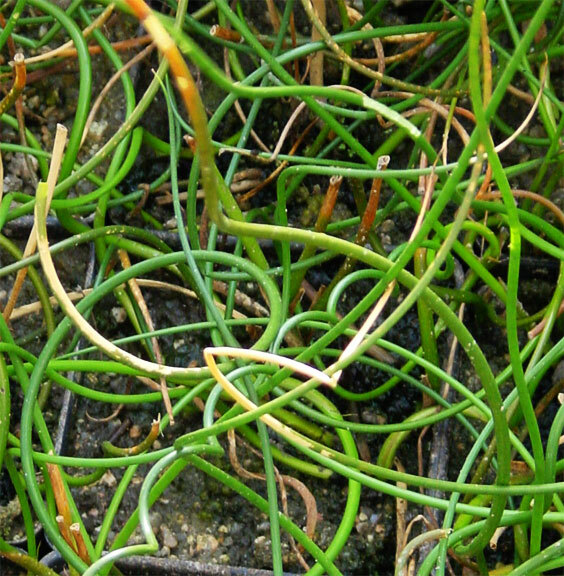 Sun to Part Shade Yellow Up to 48" 2-8"
Lizard's Tail Long stem with fragrant foliage. 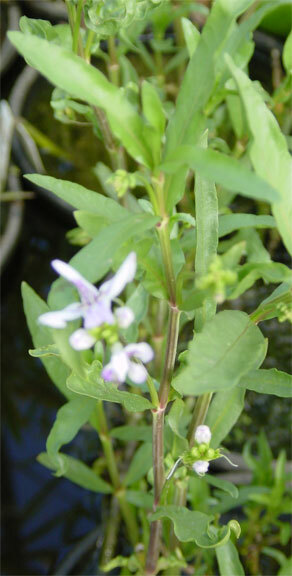 Sun to Part Shade Cream Up to 24" 3-6"
Lobelia-Blue or Salmon Green leaves. Good for filler plant. 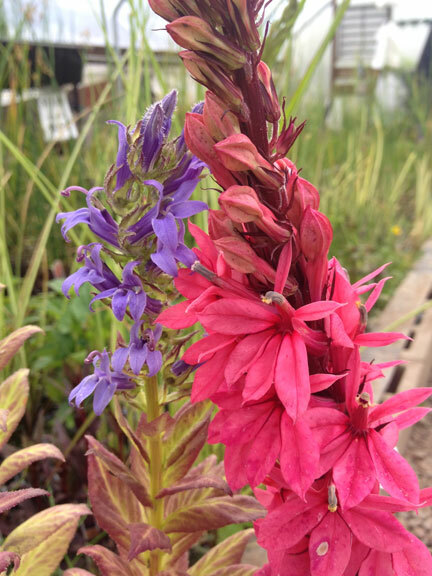 Sun to Part Shade Blue or Salmon Up to 10" 0-1"
Lobelia-Queen Victoria or Cardinal Semi-hardy. Dark red leaf colors. Trumpet shape flowers appear on tall spikes. Great for color contrast. Sun to Part Shade Red Up to 12" 0-1"
Manna Grass Colorful early emerging grass. Creamy white, pink and green blades. 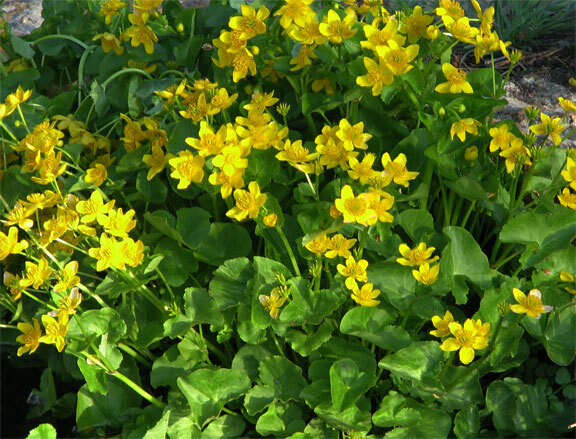 Sun to Part Shade None Up to 12" 0-5"
Marsh marigold Heart shaped leaves. First plant to flower each spring. 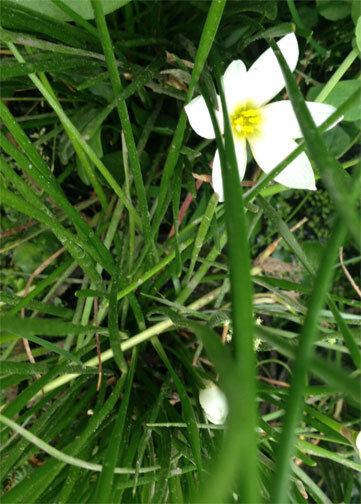 Buttercup type flower. Does well in shade. 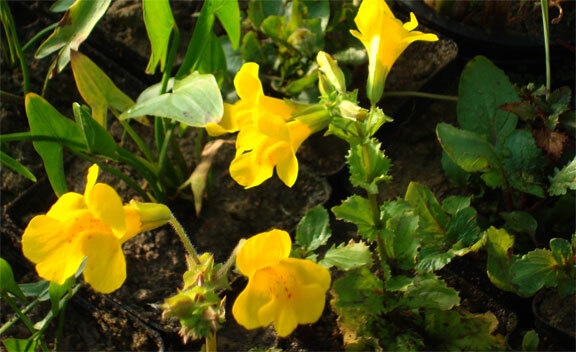 Sun to Full Shade Yellow Up to 18" 0-2"
Monkey Flower Compact plant with light green leaves. 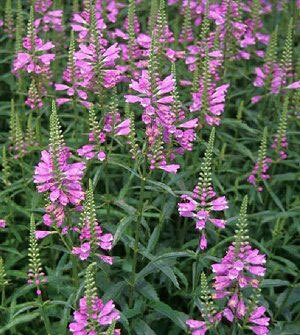 Sun to Full Shade Yellow Up to 12" 0-4"
Obedient Plant (water) Grows well in streams. 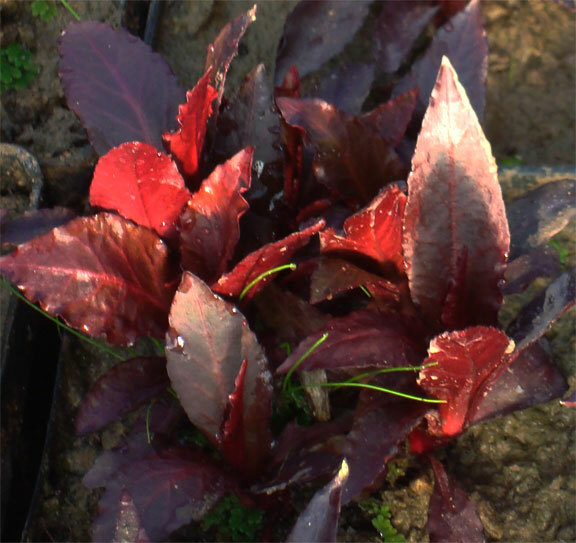 Sun to Part Shade Purple Up to 24" 0-2"
(purple) Shiny larger green heart-shaped leaves. Needs to be placed deeper to overwinter in the pond. Sun to Part Shade Purple Up to 30" 4-10"
Ribbon Grass Green and white stripe grass. Can be invasive. 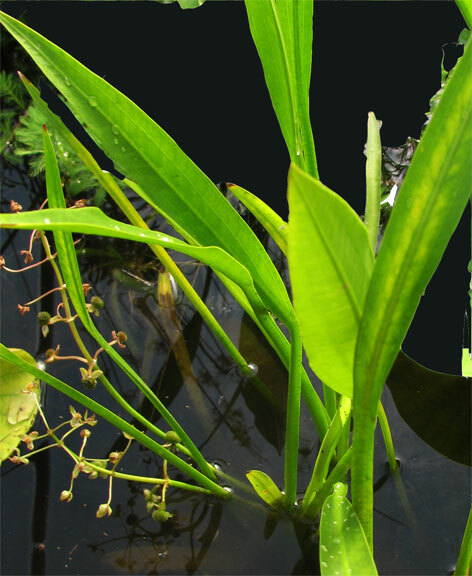 Sun to Part Shade None Up to 12" 0-2"
Sagittaria Long thin green leaves. Sun to Part Shade. 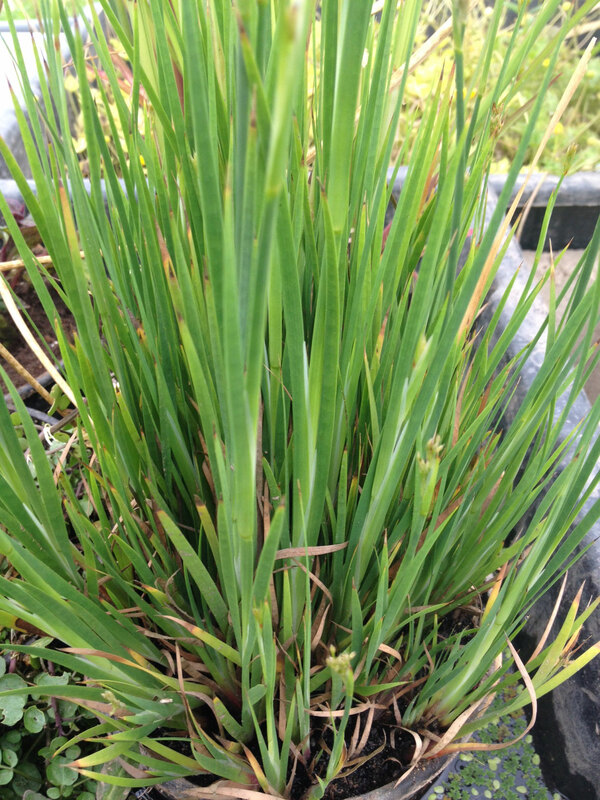 White Up to 24" 2-6"
Sedge Bluish-gray Sedge. Sun to Part Shade. 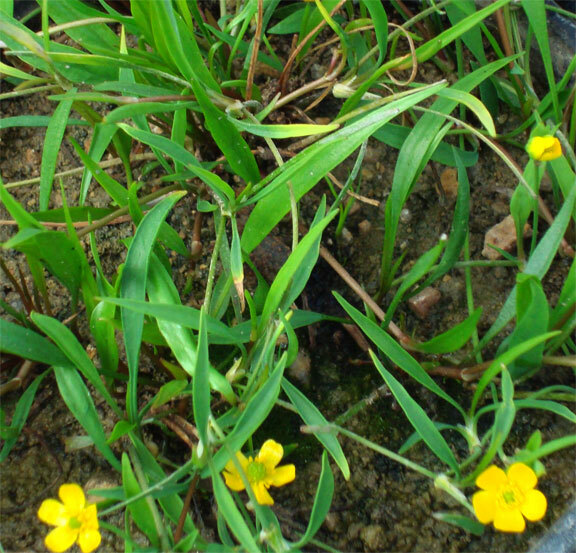 None Up to 24" 0-2"
Spearwort-mini Thin leaf creeping plant. Good for streams. 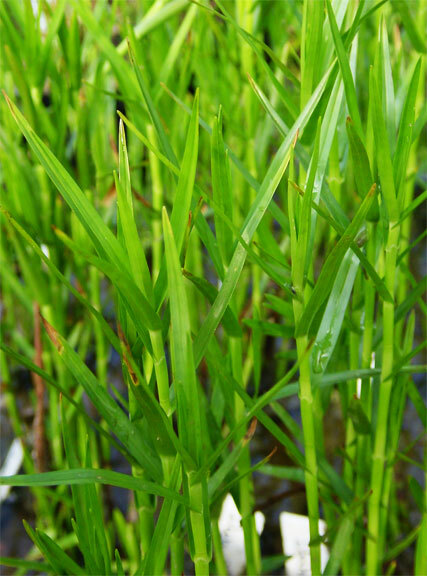 Sun to Part Shade Yellow Up to 6" 0-3"
Spike Rush Grass like plant. Good to use as a filler plant. Sun to Part Shade. 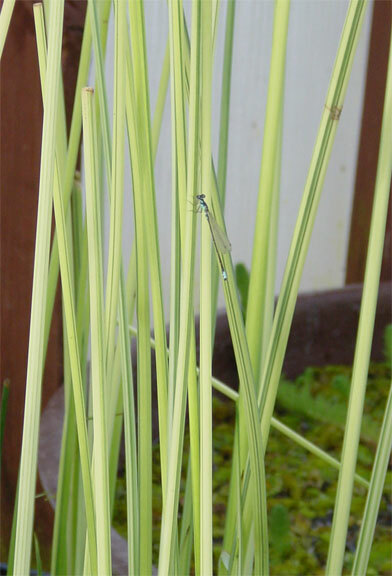 None Up to 15" 0-2"
(reg/variegated) Long glossy swordlike leves with green and white coloring. Sun to Part Shade. 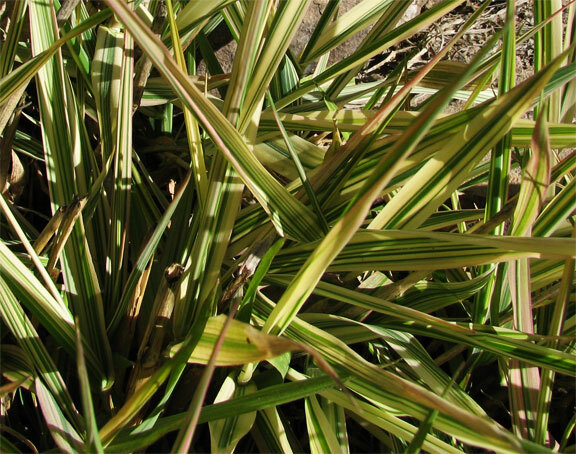 Green Up to 3' 1-4"
(variegated) Miniature version of variegated sweetflag. Not as hardy as large variety. 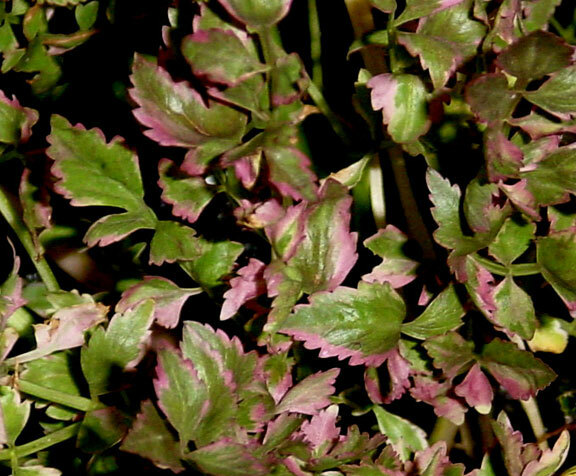 Sun to Part Shade None Up to 6" 0-1"
(variegated) Pink, white and green leaves that resemble the tops of celery. Sun to Part Shade White Up to 12" 0-3"
Water Willow Shrubby willow-like plants. 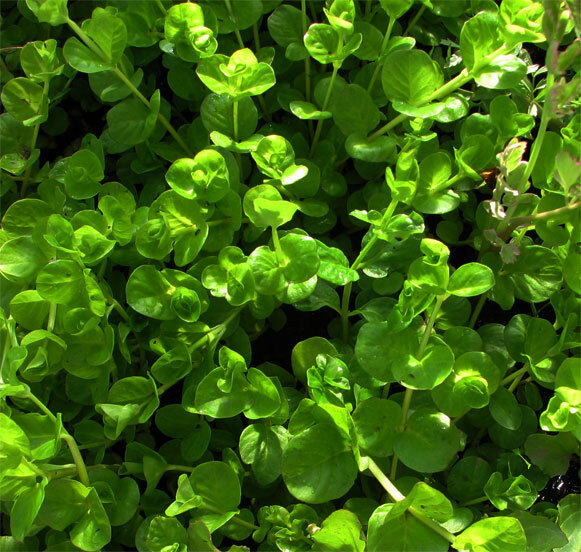 Sun to Part Shade White & Purple Up to 18" 0-8"
Watercress Grows in thick rounded clusters. Good filter plant for stream, but can be invasive. Sun to Part Shade White Up to 24" 0-4"
White Rush Strong white and green vertical stripes. 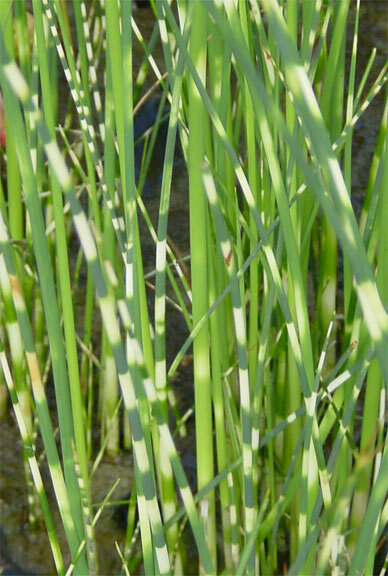 Sun to Part Shade None Up to 60" 0-3"
Zebra Rush Highly ornamental. Green and white horizontal stripes. Must fertilize regulary to keep stripes. Sun to Part Shade None Up to 60" 0-3"
Bluebell Green and puple leaf. Sun to Part Shade Purple Up to 24" 0-2"
Canna-Green Large dark and yellow stripe leaves. 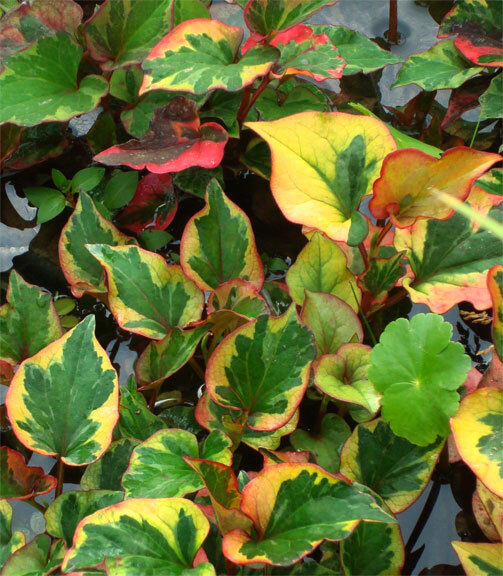 Sun to Part Shade Yellow & Orange Up to 36" 0-2"
(variegated) Large dark red showy leaves. Sun to Part Shade Orange Up to 36" 0-2"
Canna-Red Large green and yellow stripe leaves. Sun to Part Shade Orange Up to 36" 0-2"
(variegated) Large green leaf. Sun to Part Shade Orange Up to 36" 0-2"
Green Goddess Calla lily looking plant. Sun to Full Shade Cream Up to 12" 0-2"
Melon Sword Large spoon shaped leaves. Sun to Part Shade White Up to 12" 0-3"
(dwarf) Green tufts atop long stems. Smaller version of papyrus. Sun to Part Shade None Up to 36" 0-1"
(Egyptian) Large green tufts atop tall stems. Sun to Part Shade None Up to 72" 0-4"
Primrose Creeper Creeping ground cover. Can be invasive. Sun to Part Shade Yellow Up to 2" 0-1"
Spider Lily Green strap-like leaves. Unique flower. 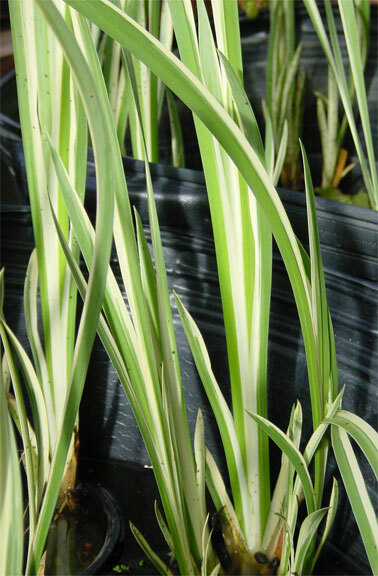 Sun to Part Shade White Up to 24" 0-4"
Star Grass Green grass type plant with a white star shape flower at tips of blades. 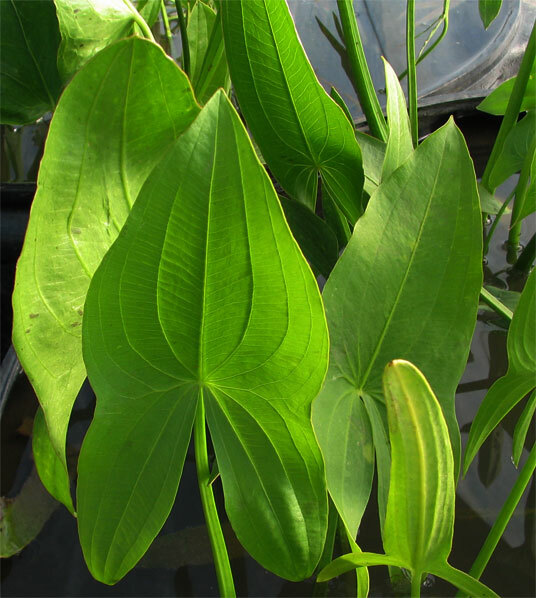 Sun to Part Shade White Up to 24" 0-2"
Taro-Green Very Large heart shape leaves on tall stems. Sun to Part Shade None Up to 60" 0-4"
Taro-Black Magic Very Large dark purple heart shape leaves on tall stems. Sun to Part Shade None Up to 48" 0-4"
Umbrella Palm Good accent plant. Plant tops resemble parasols. Sun to Part Shade None Up to 60" 0-6"
(dwarf) Smaller version of umbrella palm. 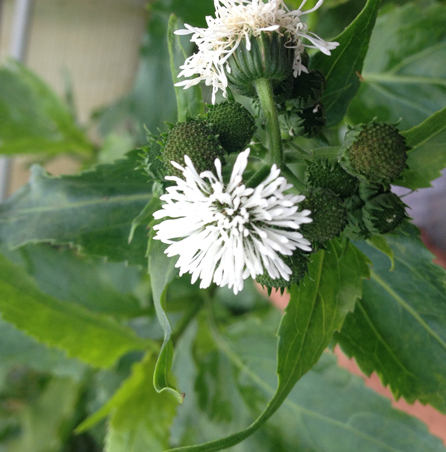 Sun to Part Shade None Up to 36" 0-3"
Water Snowball Bushy plant with glossy green leaves. 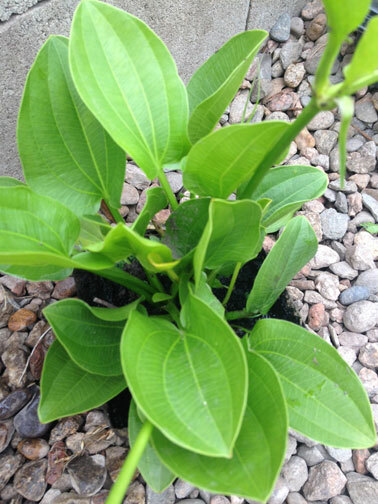 Sun to Full Shade White Up to 36" 1-4"
Water Zinnia Creeping low growing plant with dark green leaves. 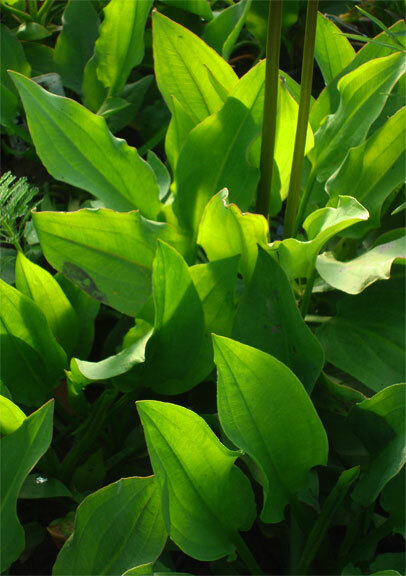 Part to Full Shade Yellow Up to 4" 0-1"
Zephyr Lily Spiked green stems. Sun to Part Shade White Up to 12" 0-2"
Orange Lily Multiple varieties. Hardy Lily with various shades of orange flowers. Most change color over 4 days. Full Sun Best Orange 12-18"
Pink Lily Multiple varieties. Hardy Lily with various shades of pink flowers. Full Sun Best Pink 12-18"
Red Lily Multiple varieties. Hardy Lily with various shades of red flowers. 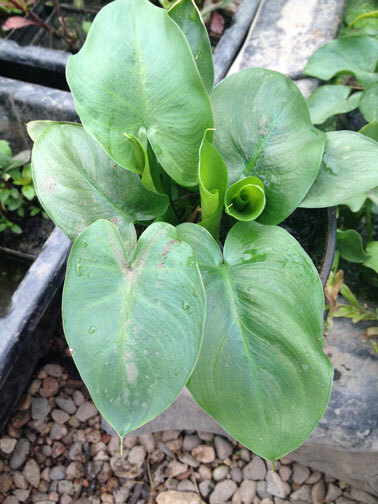 Full Sun Best Red 12-18"
Spatterdock Native very hardy lily with large leaves. Buttercup shape flowers. Sun to Part Shade Yellow 24-36"
Tropical Lily Multiple varieties. Requires warmer water. Does not overwinter outdoor. Full Sun Best Various 12-24"
White Lily Multiple varieties. Hardy Lily with various shades of white flowers. Full Sun Best White 12-24"
Yellow Lily Multiple varieties. Hardy Lily with various shades of yellow flowers. Sun to Part Shade. Yellow 12-24"
Lotus Large round leaves extend above the surface of the water. Needs winter protection. 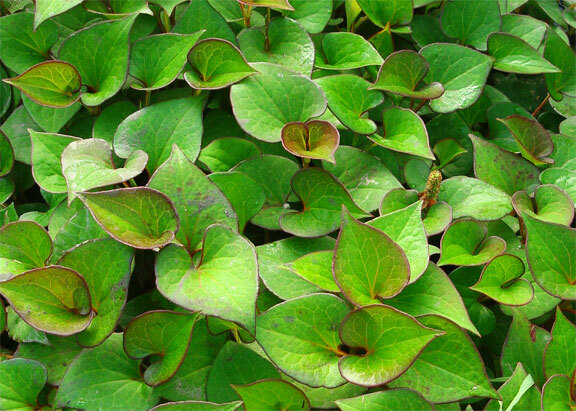 Semi-hardy Full sun best Various Up to 36" 12-24"
Floating Heart Heart shape leaves float on surface of the water. 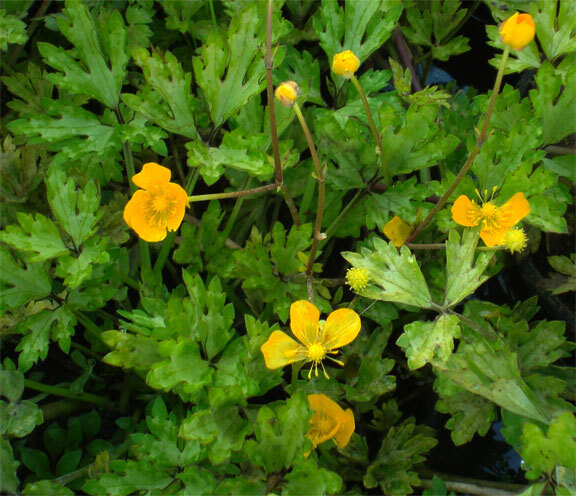 Hardy Sun to Part Shade Yellow 0" 6-12"
Snowflake Small leaves float on water. Tropical Sun to Part Shade White 0" 6-12"
Water Clover Produces cluster of four leaf clovers. Semi-hardy Sun to Part Shade None 0" 6 -12"
Water Hawthorne Long green leaves. Does best in cool water. Hardy Sun to Part Shade White 0" 6 -12"
Water Poppy Round sponge type leaves. 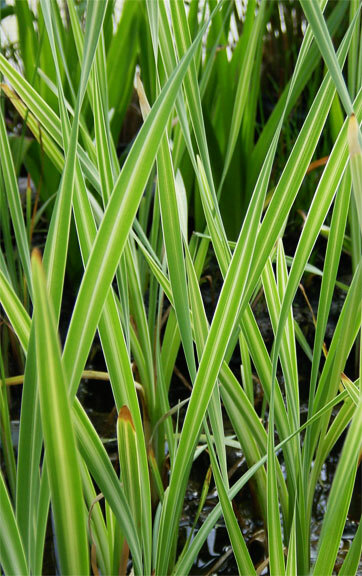 Tropical Sun to Part Shade Yellow 0" 6-12"
Water's Edge also carries a number of watergarden accessories and watergardening non-plant products such as fertilizer tabs, pumps, pond liner, pond algae cleaners. Items not in stock can be special ordered. Please call for more information.